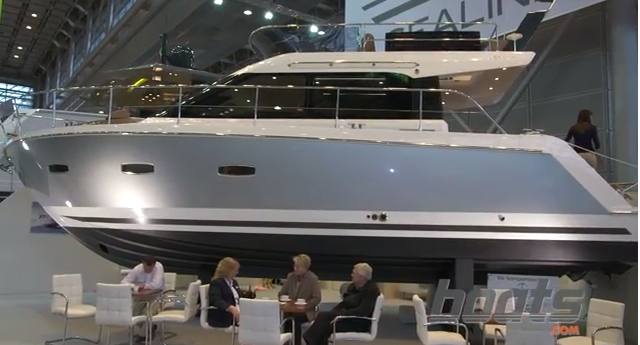 Alex Smith examines the first Cruiser line model to emerge from the reawakened Sealine stable. 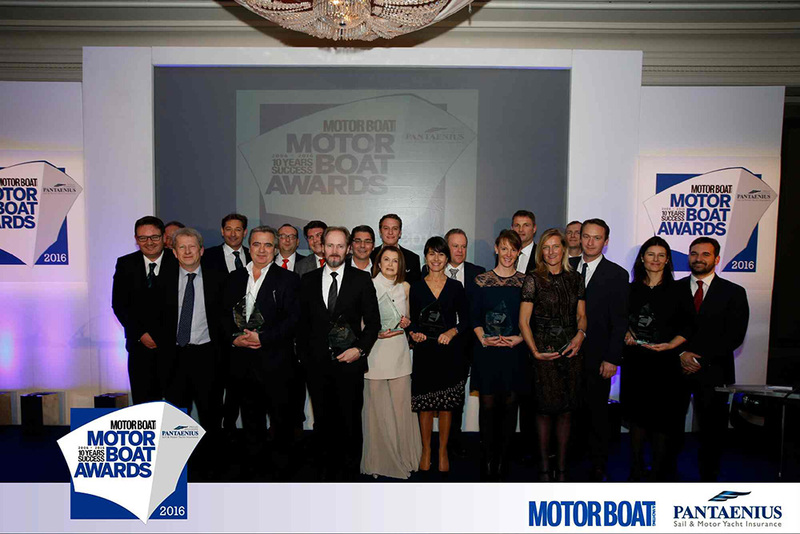 We’ve seen some pleasing stuff from Sealine since its takeover by the Hanse Group in 2013 - not least in the form of the F380, which garnered critical acclaim as ‘Best Flybridge under 55 feet’ at the London Boat Show (and featured in the 2014 boats.com list of 7 of the hottest powerboats at Southampton). That same hull has also been used for the S380, the middle of the fleet’s three-strong Sport range. 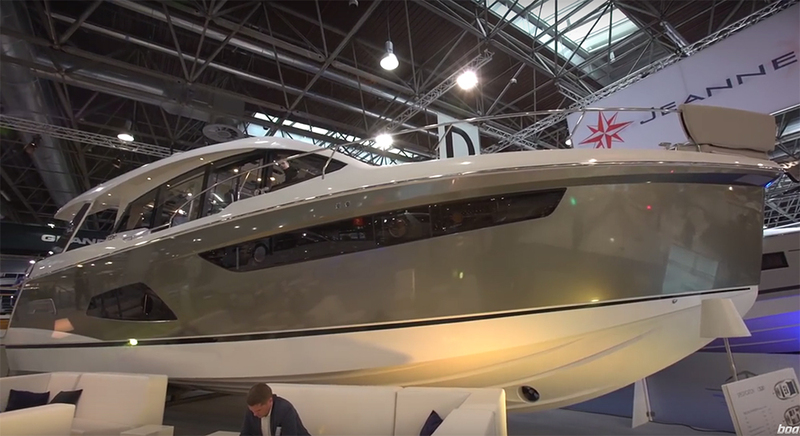 But here at the Dusseldorf Boat Show, it’s the arrival of a sixth boat that is now causing the greatest stir among the assembled press (see for yourself with our First Look Video from the show). 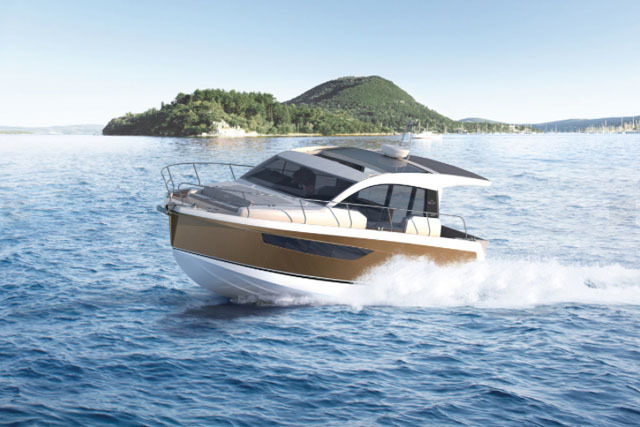 Known as the C330, it’s not just the novelty of a World debut that is piquing the attention, but the fact that this is the first of the new Cruiser line craft to emerge under the reborn Sealine marque. 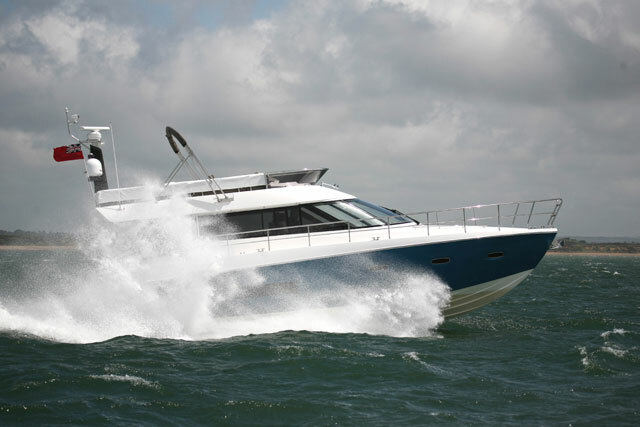 The Sealine C330 is more than just a closed wheelhouse variant of the S330. Stylistically, there are echoes of some former models in the topsides of the C330 but this is not a revamp of a pre-Hanse Sealine and neither is it merely a modified S330. On the contrary, it might use the same hull as the existing 33-footer from the Sport range but it takes a very different (and in many ways superior) approach to its use of space. In place of the all-over hardtop and open main deck, the C330 uses an enclosed wheelhouse alongside an external aft cockpit. It also brings the galley up from down below and positions it on the starboard side of the saloon. 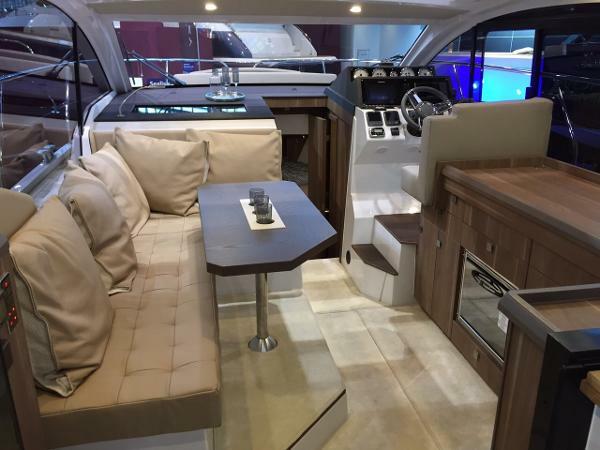 Not only does that enable the cooking area to be larger, more highly specced, better ventilated and more accessible, but it has also lead Sealine to make some big claims about the below decks spaces. With that galley duly exiled, we’re apparently talking minimum headroom of six feet allied to “the comfort of a 36-footer” - and when you’re down there, those claims ring true. The reduced communal section in the centre now contains just a compact seating area and a single heads compartment and that has enabled the scale of the beds, the volume of the storage and the deck space in the master cabin to reach levels you might not expect on a cruiser of such modest length. On the C330 the galley expands and moves up to the saloon from the lower deck. Up in the enclosed wheelhouse, a raised seating area allied to expansive, obstruction-free windows generates a huge view for the saloon diners. Opposite them, on the starboard side, the galley runs all the way from the patio doors to the back of the helm seat. The finish on this debut boat looks well up to scratch, although Sealine has factored in some serious customisation potential. In fact they boast such a variety of equipment, fabrics and colours that they claim to offer no fewer than 98,256 different combinations of finish. True, that’s about 4,000 fewer than the S330 but for most of us, it will probably do the job. Up at the raised helm, the Skipper is blessed not just with a great view but also with a sliding door that opens onto the starboard walkway (a particularly usful asset given the relatively limited access elsewhere). With the galley directly behind him and an aft-facing seat across to his left, it’s also quite a sociable and inclusive place for the driver to be. And with a sliding sunroof to supplement that lateral door, it’s actually a much more open feeling place than the all-weather security of the enclosed wheelhouse would suggest. 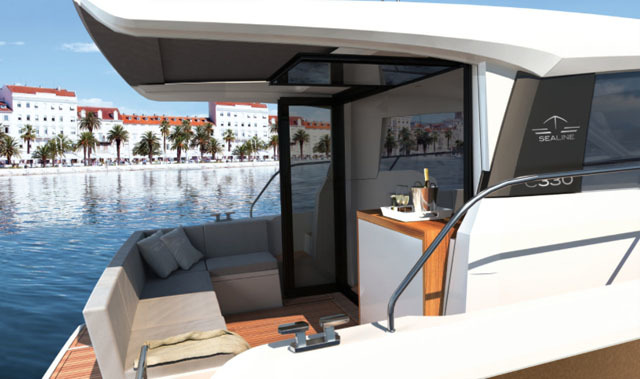 The retractable shade and opening hatches connect the aft deck with the saloon very well. However, if the wheelhouse is well sorted, it’s the open aft cockpit that really makes things work. Open the patio door to port and the tilting window to starboard and a foldout cockpit bar at the aft end of the galley bridges the gap between saloon and cockpit very neatly indeed. You can perch here at a stool with a drink or recline on the peripheral L-shaped bench to port, but either way, the interaction between the inside space and the outside world is very attractive indeed. To make matters better, Sealine has also designed a canvas extension to span the gap between the elegant overhead bars. 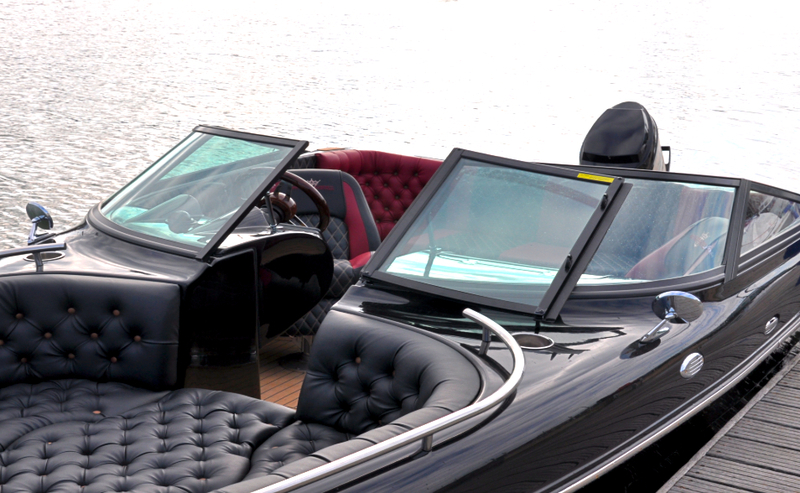 In tandem with the sliding roof in the wheelhouse, that means you can have great control over the main deck environment. You can use the entire level as a partition-free, open-plan space or as a pair of distinct sections; and whether you’re inside or out, you can either bask in the sun or relax under shelter. It’s immensely versatile and the fact that the various doors, hatches and roof sections are all manual and mechanical rather than electrical or hydraulic means there’s less expense, less weight, less complication - and in the long run, less to go wrong. There’s also a convertible dinette on the foredeck with some deepset bench seating for three, plus a generous sunbathing platform, all orbited by secure and confidence-inspiring teak-lined walkways and guarded by elevated rails. And yet despite this proliferation of upper deck facilities (not to mention the generosity of headroom down below), the C330 even manages to look quite attractive. Or does it? I’m not certain. But what is beyond doubt is that it looks distinctive - and in marine circles, that often amounts to much the same thing. The upper deck blends open and closed spaces with the inside and outside areas quite beautifully. Though 400kg heavier and a couple of knots slower than the sporting S330, the C330 cruiser looks like a more versatile and convincing package – particularly for the UK market. It has a more spacious master cabin and, despite the presence of the galley in the saloon, it also has a more flexible and user-friendly main deck arrangement. 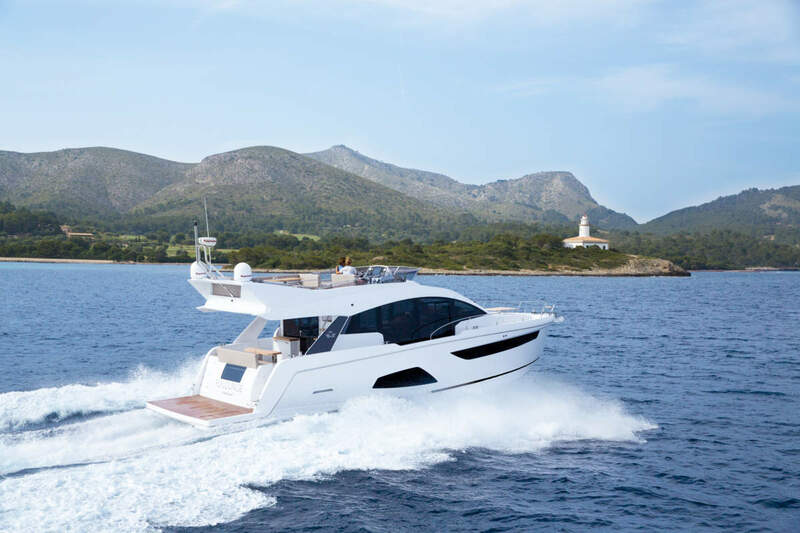 The aft end brings the inside and the outside into comfortable union without any unnecessary complication or compromise and it even offers a convertible dinette on the foredeck. Now while it would be easy to put this boat’s design triumphs down to the clear thinking industrial efficiencies of the German owners, it’s plain that Bill Dixon, British collaborator on the project, has again marked himself out as a designer of rare and remarkable ability. We haven’t yet put it through its paces on the water, but on the evidence of its showing in Dusseldorf, this thoroughly useable, all-weather family cruiser is a gratifyingly effective piece of work. 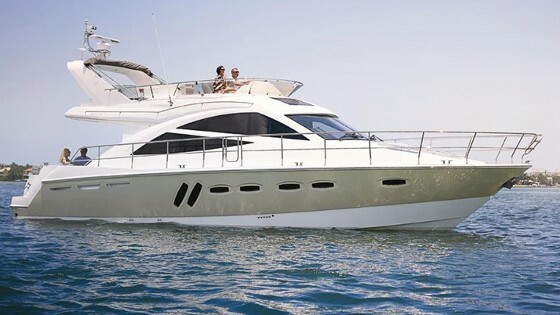 For more great family cruisers, see the boats.com reviews of the Azimut Atlantis 43 or the Marex 350 Cabriolet cruiser.